Photograph of a drawing. 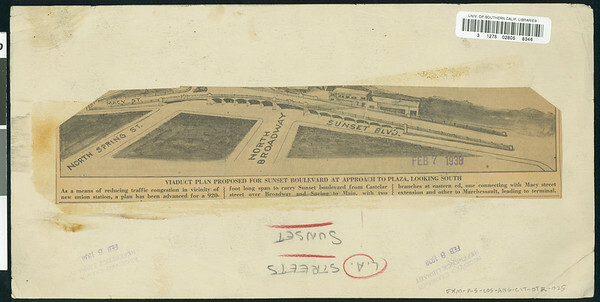 "Viaduct plan proposed for Sunset Boulevard at approach to Plaza, looking south -- As a means of reducing traffic congestion in vicinity of new union station, a plan has been advanced for a 920-foot long span to carry Sunset boulevard from Castelar street over Broadway and Spring to Main, with two branches at eastern end, one connecting with Macy street extension and other to Marchessault, leading to terminal." -- Examiner clipping attached to verso, dated 8 February 1938.